ProBono.Org was informed of the difficulties being faced by a University of Cape Town (UCT) student, Rethabile Makoanyana, who was unable to graduate due to outstanding fees. The primary issue was that a Free State municipality had contractually agreed to pay his fees but failed to do so. His follow-up calls to the municipal manager were met with either silence or hostility. The result of his failure to graduate included stress on his mother leading to her high blood pressure, him experiencing depression and his being unable to register for an honours degree. Because his appeals to the municipality to honour its agreement fell on deaf ears, he was compelled to find another conduit to assist him to settle his fees. Makoanyana complained to the Public Protector, the Deputy Minister of Higher Education and Training and the Registrar of the Constitutional Court. These approaches seemed to incense the municipality and caused it to respond by incorrectly claiming that the matter was sub judice, which simply was not true. It was then that ProBono.Org enlisted the assistance of Christopher MacRoberts, senior associate at Clyde & Co. The legal battle began with a letter of demand. This was not only necessary to demand payment of the outstanding fees but it was also apparent that the municipality refused to provide UCT with Makoanyana’s student number so the fees already paid could be properly allocated. 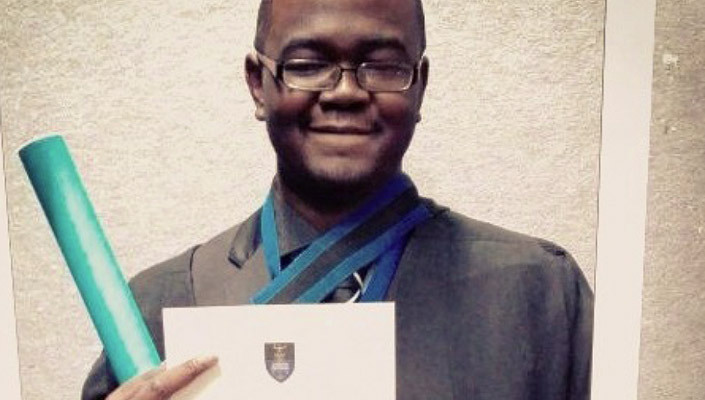 Throughout this time and despite his depression, Makoanyana continued negotiating with the university and trying to make contact with the executive mayor’s office. In an attempt to mitigate the prejudice to Makoanyana, his mother attempted to take out a loan to pay the outstanding amount but her application was declined. 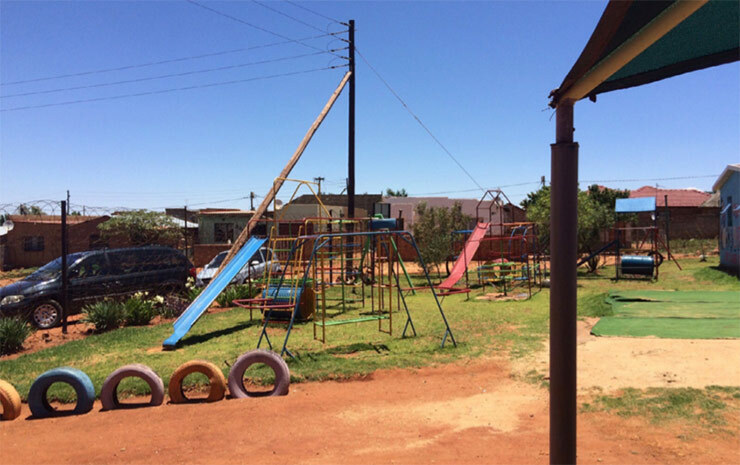 MacRoberts continued to put pressure on the municipality together with Makoanyana and eventually their collective efforts were rewarded without the need to litigate. The municipality paid all but some R5 000 of the total of R140 000 that was owing to UCT. Makoanyana’s mother made this final payment and is seeking reimbursement from the municipality. In July, Makoanyana sent us his graduation photographs and expressed his thanks for our intervention. Through this process, MacRoberts has discovered that this is an issue faced by many students who do not have the resources to take up a legal battle with their contractual funders. Fortunately in this instance, the funders were legally obligated and the documents were clear and unambiguous. Students who receive bursaries and funding for higher education should ensure that they receive proper documentation indicating the full undertaking of their funders. Students are further encouraged to reach out to ProBono.Org should they experience any such issues. ProBono.Org is indebted to the excellent service offered by Christopher MacRoberts of Clyde & Co and thanks him for his successful efforts. We also thank the student, Makoanyana for having the courage to take on the municipality and demand what he was entitled to legally and contractually. When one mentions the word domestic violence, the immediate picture that comes to mind is that of a battered woman covered in bruises with a swollen face. However the truth of the matter is that domestic violence does not end there. Perhaps she was threatened, intimidated and harassed before the abuse became physical. There is another form of abuse that often goes unnoticed and has the effect of trapping its victims and leaving them feeling they have nowhere to run. This is called economic abuse. In one of our client’s cases, A (wife) was married to B (husband) for about four years. A few months into the marriage A was asked to leave her job with the promise that B would take care of her and her two children from a previous marriage. However as the marriage progressed, B started having endless affairs and whenever A confronted him about it, he would get very defensive and abusive, he would threaten her with divorce proceedings coupled with endless insults, threaten to kick her out of their matrimonial home and then he would confiscate her car keys, cut off all money and freeze all the credit cards that she used. With the fear of being homeless and going hungry with two children to feed, she was forced to succumb to the abusive marriage. Economic abuse in short includes the unreasonable deprivation of economic or financial resources to which the victim is entitled or requires out of necessity, including mortgage bond repayments or rent. It essentially traps a person into living in a marriage or relationship from which escape becomes impossible. Anyone who is a victim of domestic violence can approach the nearest Magistrate’s Court to apply for a protection order that includes a monetary award. This can be applied for during ordinary court hours, or on weekends and public holidays if the case is urgent. The applicant does not have to wait for the court to allocate a date for the hearing but can get an interim protection order, requiring the abuser to pay the rent or the bond, to pay to the applicant emergency maintenance or pay for the expenses that the applicant incurred as a result of the abuse, such as medical expenses. The protection order is valid throughout South Africa regardless of where it was issued and remains valid until such time that it is withdrawn, cancelled and/or set aside by the person who initially applied for it. The order may be varied by changing some of the terms. For example it may change the address of the premises at which the abuser is not allowed to enter. A protection order may appear to be useless since some abusers view it as a piece of paper, but its power and effectiveness lies in the suspended warrant that the court issues with every protection order. The warrant is used if the abuser contravenes the protection order. The holder of the protection order must inform the police of any such contravention. The police are compelled to effect an arrest and the abuser can be charged with contempt of court. This carries a sentence of five years with an option of a fine, or both. It is important to note that such a warrant may only be used once. Thereafter the applicant needs to go back to the court to request another warrant to be issued by way of affidavit indicating when the previous one was used and outlining the need for a new warrant to be issued by the court. This process needs to be repeated each time a warrant is used up and a new one is required. What is critically important is that the applicant depends on the police to cooperate and take action. If this does not take place it is necessary to report such non-cooperativeness to the most senior police official in the station to ensure enforcement. Following the Students for Law and Social Justice’s nomination of the executive director of the Southern Africa Litigation Centre (SALC) for the position of public protector, Kaajal Ramjathan-Keogh is on the parliamentary shortlist for the job. 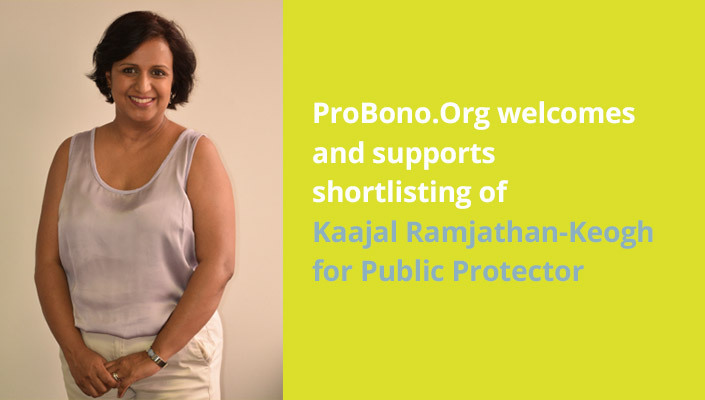 ProBono.Org has worked with Ramjathan-Keogh from her days at Lawyers for Human Rights up to and including her time at SALC. Ramjathan-Keogh also sits with members from ProBono.Org on the steering committee for the annual Public Interest Law Gathering. We heartily support Kaajal’s nomination, she being a nominee who is characterised by independence and integrity, both qualities required for the position of the public protector. Article by Luke Gonçalves, OCAY legal intern, published in Probono.Org June 2016 Newsletter. By virtue of ProBono.Org’s expanding One Child a Year (OCAY) project which launched in 2014, our presence was secured as a stakeholder at the National Child Care and Protection Forum hosted by the Department of Social Development in March this year. Held in conjunction with USAID, the three-day conference provided updated information sessions by key speakers in the sector on various issues a ecting children. Attendees included the Centre for Child Law, Sophiatown Community Protection Services and the Commission for Gender Equality. These sessions were coupled with lively debate and solution-seeking discussions. At the forefront of the discussions were the challenges faced by many organisations and departments in securing the best interests of South African children on many levels. Departmental officials at national and provincial level provided clarity as to the policy and framework in which the public and private sector should operate in providing assistance to children. A number of complex issues were covered, ranging from inter-country adoption and basic education to support grant applications. Concerns were raised, primarily from academics and civil society, with regard to the current White Paper on Social Welfare and the general principles of international conventions to which South Africa is a party. ProBono.Org had an opportunity to inform participants of the practices and issues observed in the children’s cases we have dealt with as part of the OCAY project. These cases range from obtaining protection orders to securing education or other basic services. The matters often include a complexity of circumstances, entangled competing legal issues and systemic gaps in the child protection system, which make them difficult to process or to refer to private sector practitioners. Our cases seldom entail a single legal aspect, but despite this our office has become particularly adept at identifying the main issues in providing legal representation or support for children in need. In securing legal representation for children, the needs of the child may coincide with the needs of the parents or the assistance required by them to secure the welfare of the child, but this is not always the case. 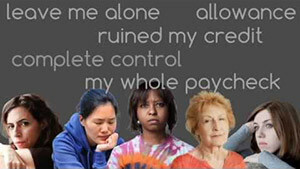 Sometimes the welfare of the child is not the parents’ or caregiver’s priority and these needs or rights do not align. In these cases, children are at an increased risk of being neglected, exposed to secondary trauma or further abuse. Children without formal documents are subject to various forms of discrimination. They face ongoing struggles in accessing basic and/or public services, ranging from education to health care. The forum members affirmed this, while raising concerns of capacity and resources within the child protection space to address this gap. ProBono.Org’s effort to secure children’s rights was noted as making a significant impact in identifying systemic problems within the child protection system. This is significant because the OCAY project is aimed at ensuring long-term empowerment of children and realising important constitutional rights for them. ProBono.Org is well positioned to identify, assist and secure the legal interests at hand for each child it assists, which is most likely to improve the overall welfare of the child in a particular matter. Through the pro bono contribution of private legal practitioners we attempt to give children a voice in legal proceedings. In the OCAY project, we deal with many of the processes raised by those present at the meeting. These relate specifically to the functioning and registration of child and youth care centres (CYCCs); policies and associated gaps in ill-enforced partial care; child protection as a cumbersome and inter-sectional approach in the judicial system; declaratory orders and, lastly, issues relating to children in need of care and protection. Our offices were able to provide input by way of our past and present cases. Our concerns with regard to practical failures in exceptional and challenging cases (which existing policy either does not cater for or where it is not up to ‘the best interest of the child’ standard) were aired. We were able to provide information on the noticeable gaps between policies and practices in our dealings with the Department of Home Affairs and orders granted by the Children’s Courts. It is of concern that many of the issues we raised were echoed by other stakeholders in attendance. ProBono.Org was pleased to have been afforded an opportunity of high level engagement with the Department of Social Development and others, as it provided a platform where our services were made known to the sector. We have been approached to make a presentation at the next National Child Care and Protection Forum. We also wish to extend our appreciation to the various departments, including Basic Education and Health, who have subsequently made contact and provided guidance in resolving several of our children’s matters. Article by Annelie du Plessis, published in Probono.Org June 2016 Newsletter. Mrs Zanele Gladys Mokolo, in her capacity as coordinator of the Itsoseng Women’s Project (IWP), approached our offices for assistance in a matter involving the Johannesburg Property Company. The IWP serves the community of Orange Farm by providing skills training programmes and community based projects to unemployed women in the area. 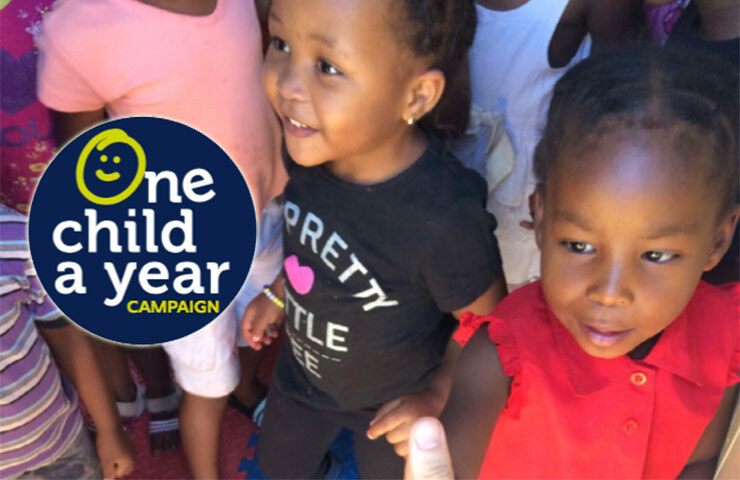 One of these projects involves running a crèche for children between the ages of 0 to 6 years. The IWP presently has about 60 children in its care. The project also provides the destitute with a source of income through its recycling activities. Each programme operates from shipping containers on the premises, donated by the Department of Social Development, Agriculture and JAM SA, and one of these containers serves as the crèche. The crèche employs four child minders, a cook and a gardener, and together with its recycling activities it employs about 18 women. 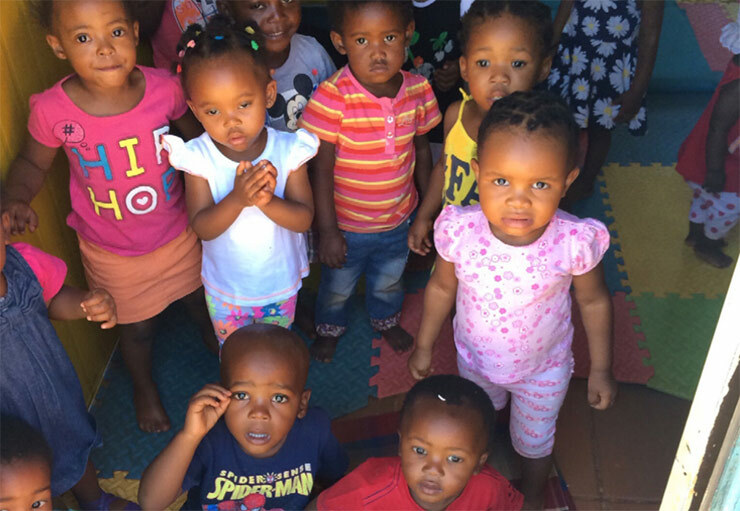 Social Development provides subsidised funding to the IWP but this only buys food for about 36 children and barely covers the salaries of the crèche employees. The IWP provides the children with lunch. Most of the parents in the area cannot afford to pay crèche fees and for many children this is the only meal they receive. The IWP does not own property. It has been leasing the erf in Orange Farm for several years. Before 1994, the Transvaal Provincial Administration (TPA) managed this property but in recent years it was given to the Johannesburg Property Company (JPC) to manage on behalf of the City of Johannesburg. Following the disbanding of the TPA, the IWP was told by the JPC to re-apply for a new lease agreement in terms of a tender process, citing the Municipal Finance Management Act of 2003 (MFMA) as the basis for this change. Such an application involves a submission in accordance with the JPC’s Standard Transaction Application Form process and requires a R3000 application fee. The IWP was not in a position to pay this fee or go through the tender process and requested assistance. An attorney, Neil McKenzie from Fasken Martineau provided our offices with a comprehensive opinion on the JPC’s proposed negotiations concerning the lease agreement with the IWP. Various meetings were called to secure the IWP’s lease without going through the proposed tender process. This led to the JPC’s discovering that the premises were never formally registered with the Deeds Office. Further meetings and negotiations ensued, which ultimately led to the JPC agreeing to let IWP stay on the property, while it resolves the transfer and registration issue with the City of Johannesburg and the Deeds Office. The JPC’s proposed tender process would have had far-reaching implications for the Orange Farm community as a whole. A tender process in terms of the MFMA is inappropriate for struggling social welfare organisations. ProBono.Org knows of at least 300 other NPOs (crèches) in a similar position. These NPOs provide a vital service to the community through employment, empowerment, training, education and food provision, but remain insufficiently funded or supported. These NPOs stand to lose properties that they have occupied for years, leaving many of their beneficiaries (mostly children) deprived and without any alternative care options. They are also not receiving sufficient funds or grants, which strains their resources even further. For the above reasons, our offices, along with Gladys and her children at the crèche are grateful for Neil McKenzie’s dedication and commitment in finalising this matter. We hope this case will set a precedent, impacting on other NPOs in the area. Article published in Probono.Org June 2016 Newsletter. On 25 June 2015 our offices sent out a request for assistance on behalf of a young man in need of financial assistance from his biological father. This young man had previously been removed from his family home (due to substance abuse) and placed with his elderly aunts by the Children’s Court. Although this placement was secure, the aunts were both on pension and not in a position to care for this boy financially. The young man (we will call him C) brought a maintenance application in court, requesting financial support from his father. However, his father, who also appointed a legal team to argue the matter, opposed this application. C felt intimidated and overwhelmed by this and sought assistance to see this application through. Jonathan Small and Sune Bosch of Ramsden Small Attorneys accepted the instruction and assisted C in arguing in court for financial support from his father. The application was heard in May this year and after hearing argument for both sides, the court granted C maintenance in the sum of R5000 per month. C is now enrolled for further studies and hopes to complete a financial degree. J, a girl of 7, was found abandoned on the 9th floor of the Charlotte Maxeke Hospital in Johannesburg in December 2015. An initial assessment by the hospital staff showed that she could be autistic. The police were called to transfer her to a more suitable place of safety but for whatever reason could not effect this transfer and the young girl spent the night at the police station. She was then admitted to the Rahima Moosa hospital and our offices were asked to assist with finding her a suitable placement. Our involvement was necessary since no state department has accepted responsibility for her placement. Both the Department of Health and the Department of Social Development have been unwilling or unable to accommodate her. We are presently looking at bringing an application in the Children’s Court for a temporary care placement order for the little girl at a private facility with autistic expertise. Despite our having extensive legislation aimed at protecting the rights of children, such as the Constitution, the Children’s Act of 2005 and the Child Justice Act of 2008, each of which create a strong legal framework in support of children’s rights, there are still substantive barriers to the real lived protection of children. The barriers are not in the design of the laws, but the way in which these laws are managed, implemented and administered. When we see that departments responsible are failing people on a day to day basis, and that the officialdom is characterised by tardiness, lack of interest, ineffective management, poor skills, lack of capacity; and when we see the over-burdened courts and overall inefficiencies in the system, we believe we have an imperative to act and offer assistance. So many of our clients have attempted to use the legal system to obtain relief, only to find that without legal representation they have been unable to exercise the rights they have in terms of the laws we have on our statute books.